Our thanks to Paul Francis from the Airfield Research Group who contributed this report. Text and photographs copyright Paul Francis/ARG. In February 1941, Bernard Brunton and Rolfe Gilbert Booth, both of 6 Woods Mews, Park Lane, London submitted applications 1821/41 for a patent in support of their invention with regard to wall and roof panels for huts. In January 1942 the two inventors submitted a further two designs 9144/42 and 745/42 this time for patents in support for their invention of a prefabricated building having hollow box-like beam members that are supported on the upper edges of the exterior walls. The walls being constructed of timber frame clad with asbestos sheeting and the void filled with insulation material. It is believed that the applications were made before Selection Engineering and Uni-Seco Structures Ltd had been registered as companies. The design which incorporated all aspects of the above applications became Seco Mk.I System of unit construction. The name ‘Seco’ originates from the initials of Selection Engineering Co Ltd which was responsible for the design and development of the Seco Unit System of Construction. The company therefore functioned as a design, research and development practice based in London with a supporting network of 26 manufacturing centres spread out all over the UK. These were organised on a franchise basis and over 200 construction firms were available to erect the buildings. Flat-packed huts and dwellings were taken from the manufacturing centres by rail and stored at regional depots, awaiting distribution to where ever they were required. Staff employed in the London offices were experienced architects, chemists and engineers. The head office was at 6 Woods Mews which was also part of 25 Upper Brook Street (also used by the company), Mayfair London. During the Second World War, the company erected a two-storey laboratory and offices at nearby at 12-16 Wood Mews, on a blitzed site – this was demolished in the early 1990s when a large part of Woods Mews was redeveloped. 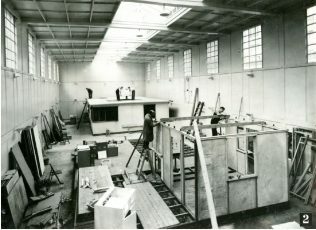 It is unknown when Uni-Seco Structures commenced trading, but by September 1942, they had already organised the manufacture and supply of component parts for both Mk.I and Mk.II huts and had issued memos to contractors requesting that they take care in assembling them, as the huts might be required for the post-war housing shortage. At the same time the company Selection Construction Co Ltd had a staff of trained erectors and supervisors on hand should they be required to advise contractors. component parts (made from light timber sections – roof spars, cross ties, keel-plates and door frame units). Assembly required a minimum of labour, buildings were erected dry, all screw holes were pre-drilled in the factory. A typical Air Ministry Mk.I (60ft by 19ft 7in) hut weighed less than 8-tons. Roof loads of the smaller huts were carried by internal partitions called Cellular Construction and this arrangement was also suitable for small post-war domestic houses (Seco Mk.III). Larger span buildings were based on ‘Aero’ beam and columns to create open-plan internal arrangements, for use as canteens, hospital wards etc. Clear spans were available between nominal dimensions of between 19ft 7in and 35ft. During the war period, the Ministry of Works and Planning, Lambeth Bridge House, London supplied all drawings to contractors. In 1944, the company submitted plans for small detached two-bedroom (23ft by 19ft 7in), based on their Mk.I hut for London’s blitzed sites. The kitchen and living room arranged as a single room. There was also a semi-detached WC and fuel store that served a pair of dwellings. No bathroom was provided. 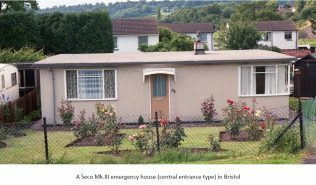 For the Government’s Temporary Housing Programme, the company designed a small detached two-bedroom bungalow that featured the same back-to-back kitchen and bathroom service units for all emergency housing types such as the aluminium B1 / B2 types and the Arcon Mk.V bungalow. The units were made from pressed steel to a design thought to have been associated with the company Fisher Ludlow Ltd of Birmingham who along with its inventor, had submitted an application for a patent in support of the demountable kitchen / bathroom service unit (6444/43) in April 1943. This was to the design of Edric Neel, ARIBA of 52 Grosvenor Gardens, London SW1. It is believed that this design was adopted by the Ministry of Works as the standard emergency house demountable service unit. There were two variations one for the England and Wales and another for Scotland. The Uni-Seco Mk.III temporary house was the third most common type of the programme with 29,000 built. It was based on a system of standardised posts, beams and panels assembled on a grid pattern. The principal materials used were timber, asbestos-cement and wood wool. Posts of box section were erected at 12ft centres and these connected with built-up timber and asbestos-cement roof beams. These were sloped on top to give a series of low-pitch trusses which in turn were connected together by purlins and these carried the roof slabs covered by roofing felt. Wall cladding used similar slabs to those on the roof, except where steel window units were fitted. There were two version, one with a central entrance and the other with a corner entrance, they were both Mk.IIIs. These were all two-storey perspective permanent houses, type Mk.IV was a minimal cost house and types Mk.V to Mk.VII being designed around the ‘Secoframe’ system of construction. It is unknown whether any of these buildings were ever constructed. 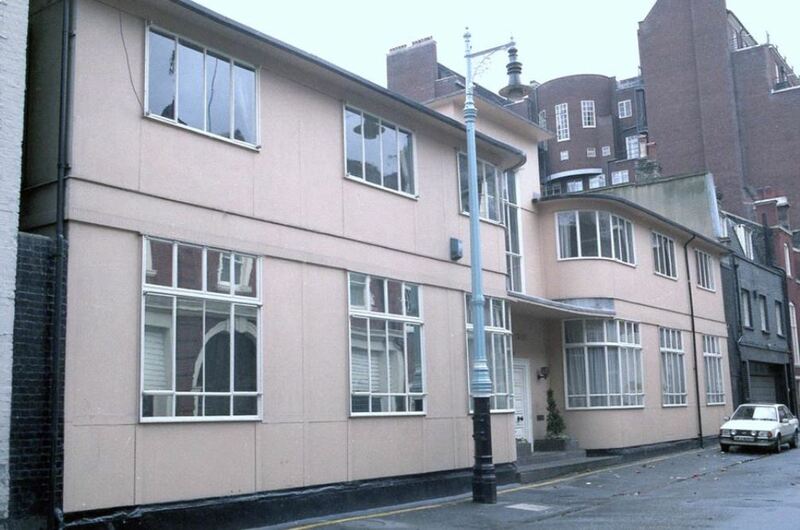 In the early 1950s the company name changed to Selection Engineering Co Ltd, the address changed to 11 Upper Brook Street, before moving to 26 Margaret Street, London and the company rebranded itself as the Selection Construction Company Limited (the Uni part of Uni-Seco name had by now disappeared), and around 1958, it relocated to 14 Bloomsbury Square. Most of the company’s inventions were the work of Bernard Brunton, but his name disappears from the company patents submitted after 1956 and replaced by William Andrew Balmain, Ronald Gordon Emsley and Henry Charles Frederick Giddings-Green. The Air Ministry purchased several Mk.VIII buildings, with a small version erected at Lakenheath, two large ‘Z’ form barrack blocks at Little Rissington and six ‘Z’ form barrack blocks at Sculthorpe. Yet another company, Secometric Limited was founded on 15 August 1947, with a manufacturing facility at Wickham, Essex, in January 1980, the firm was bought by the Wernick company of Billericay, who closed their factory and move its staff to Wickham, this purchase gave Wernicks a design and build concept of modular buildings. The Secometric and all other company names are now dormant. surely we can come up with an updated version for today’s needs . A complete history on Seco Structures .